Lock in a great price for Holiday Inn Resort Aruba - Beach Resort & Casino – rated 8.2 by recent guests! Right on the beach, and right across the street from the marketplace. pretty hotel. lots of services. resturants. great music. clean beach. in the heart of resort area. best price for location. We enjoyed the activities that were available for the children. Best value at this perfect location, friendly and helpful staff, nice hotel grounds, pools and beach. Rooms nice size, clean, great beds and bed linens, nice large shower and bathroom. I truly enjoyed our experience at Holiday Inn & Resort, Aruba. Everything was great! The food was great and the drinks were awesome. It is a beautiful place and surrounding areas. I will return. The proximity of the beach to the room was perfect. The casino was fun, we won money each night we went. The hot tub was good. The room was comfortable. The sunsets were awesome. Rooms while older were very comfortable especially the beds. Location excellent both at beach side and outside the hotel. Casino small. Location, close to town and beautiful beach and pools. 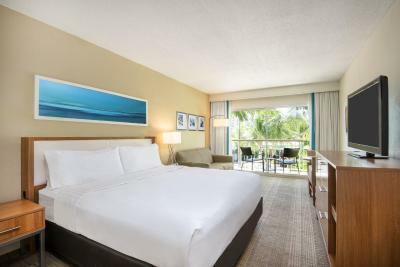 Holiday Inn Resort Aruba - Beach Resort & Casino This rating is a reflection of how the property compares to the industry standard when it comes to price, facilities and services available. It's based on a self-evaluation by the property. Use this rating to help choose your stay! One of our top picks in Eagle Beach.Set directly on the beach in Palm Beach, Holiday Inn Resort Aruba - Beach Resort & Casino features 3 swimming pools, 4 restaurants, a casino and live nightly entertainment. Free WiFi throughout is available. Start the day at the Holiday Inn Resort Aruba with a cup of coffee from in-room coffeemakers and enjoy beautiful views from private balconies or patios. You can also take advantage of the 24-hour fitness center. Dining options at the Holiday Inn Aruba include the Sea Breeze Restaurant & Bar, Corals Restaurant and Oceanside Bar & Grill. You can also enjoy fresh pizzas in Pizza Now! and Italian cuisine in Da Vinci Ristorante. In-room dining is also available. Top-rated golf courses, scenic horse riding trails and exceptional shopping centers can be found within a short distance of the Aruba Holiday Inn - Beach Resort & Casino. 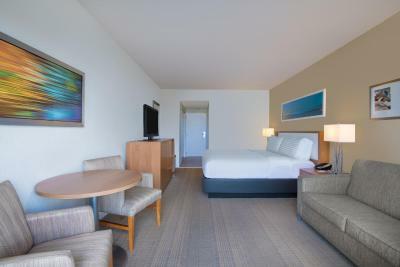 When would you like to stay at Holiday Inn Resort Aruba - Beach Resort & Casino? This room features fresh crisp linens, modern furniture, natural lighting and modern décor. It also includes complimentary WiFi access, in-room safes, mini fridge and flat-screen TV's. It has a private balcony. This room features fresh crisp linens, modern furniture, natural lighting and modern décor. It also includes complimentary WiFi access, in-room safes, mini fridge and flat-screen TV's. It has a private balcony offering a partial view of the beach. This room features fresh crisp linens, modern furniture, natural lighting and modern décor. It also includes complimentary WiFi access, in-room safes, mini fridge and flat-screen TV's. It has a private balcony offering a direct view of the spectacular beach. This twin room has a tumble dryer, air conditioning and seating area. Holiday Inn Resort Aruba – Beach Resort & Casino, is situated on the most desired beachfront location in Palm Beach. Come and enjoy our improvements and fresh renovations to all guest rooms, restaurants, bars and leisure areas. House Rules Holiday Inn Resort Aruba - Beach Resort & Casino takes special requests – add in the next step! Holiday Inn Resort Aruba - Beach Resort &amp; Casino accepts these cards and reserves the right to temporarily hold an amount prior to arrival. Holiday Inn Resort Aruba - Beach Resort & Casino accepts these cards and reserves the right to temporarily hold an amount prior to arrival. Extra beds are available upon request. Please note that all extra beds are rollaway beds. That you had to rent the palm umbrellas. The front desk was not as polite at first reception. The laundry service was very poor. Restaurant reservation was not available up front. Beach seats were not enough for hotel guests and not reservable up front for hotel guest. The hotel is old and dated. The rooms smelled musty and the air quality is horrible. My reservation was screwed up. They changed my room four times. The manager was very rude when I told him I'm disappointed in the quality and service. He stated he was doing me a favor by ensuring my accommodations were corrected. Never again would I stay at this hotel. It's truly not worth it. The pools are all closed by nightfall. No nightly swim. The palapa lottery, etc is a total mess. And it’s just not me. The entire line of people agreed. Their process is terrible. You have no idea which ones are available, the y seem annoyed that you take so long to pick one when you have no idea which to choose from. A simple board with an erasable market so as each is taken, the people in line behind can already know which one they want. Each person has to ask the same question when it’s their turn. One day we got number 7. We’ll, they don’t tell you there are TWO number 7s, so, short story, with their process, we lost the one we waited in line for and didn’t get any. And with a slight language barrier. Ugh! For the price, stay down the street at any of the other high rises. Staff was very unfriendly/not accommodating. Did not ask how our stay was. The noise overall in the room is out of this world. Bass from the music at club Mambo Jambo on the beach was shaking our room until 1 AM. Will not stay again. location was great. Thats about it. Room billed as “standard has balcony”, no ocean view understood, but really had no view. Had expected maybe garden view. Balcony there, but had high cinder block wall. Great for drying clothes as didn’t blow away in Aruba wind. Okay with us as we don’t spend much time in room on vacation. Sometimes the bar tenders were a little slow. The beach palapas system is a bit strange... considering the hotel’s value, paying (a lot) for a place in the beach is unacceptable. Rooms were a little warm/humid.